Spirit of Beauty is an amazing skin care line that I was introduced to last summer by a dear friend of mine who is a professional in the spa resort industry. I was delighted to be introduced to the maker of these fantastic products, Martha Buldain to help her with a branding makeover project. It has been a lovely and inspiring journey. Spirit of Beauty is a unique bio-active and holistic skin care system that blends the most advanced cosmeceutical and natural vitamin therapy with botanical extracts and essential oil ingredients to promote beautiful healthy skin at any age. Not only are these products powerful and restorative for the skin, they also invigorate the senses with therapeutic essential oils leaving you glowing and inhaling deeply throughout the day. I will share before and after pics soon. So far we have enlivened the logo which is now lighter, more feminine, and modern. 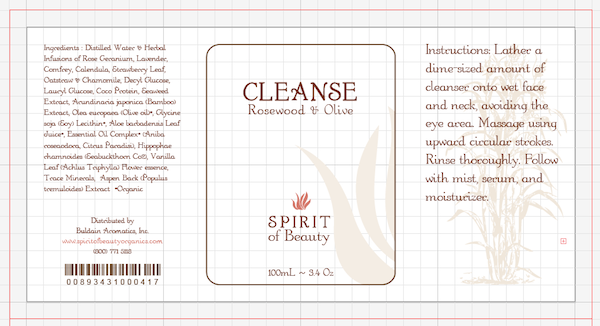 We have given the product labels a complete makeover. The products are stored in amber bottles to protect the integrity and quality of the product. I chose to present a pure white label with the graphic elements and typography in shades of amber to work with the beautiful amber hues of the bottles. Once we finish the labels, we are on to the website. Thank you! Miss you too!! !